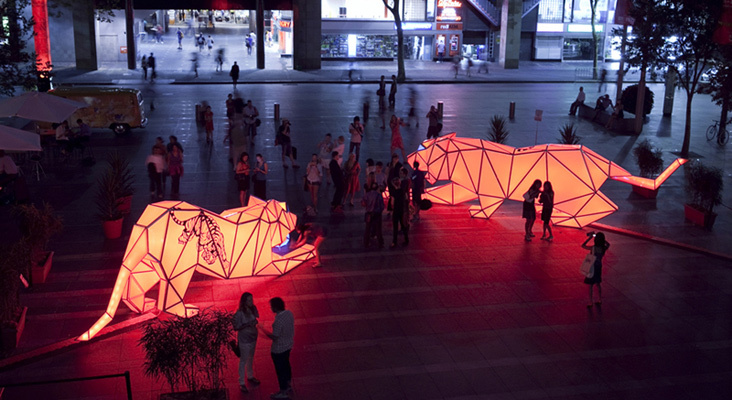 Installed to coincide with Chinese New Year, the digital tigers fused ancient lantern making methods with cutting edge digital design and fabrication technology. Following LAVA’s mission to build more with less, the 2.5 metre tall tigers, each 7 metres long, weigh only 200kgs. A recyclable, light-weight membrane studded with pulsating low-energy LEDs is stretched over an aluminium frame. A supporting installation of 88 mini origami tigers, also made from fully recyclable material, was arranged over the city model inside Customs House.